Under California’s vehicle codes, police can charge a driver who is DUI in Los Angeles with a felony if that driver has had three previous convictions for driving under the influence in the last 10 years or if the driver has had a previous conviction for a felony DUI. The law does not specify what type of motor vehicle the person has to be driving for that felony charge to stick. The DUI laws in Montana have a similar provision, which is unfortunate for 64-year-old John Adrian Langstaff of Missoula. He wasn’t behind the wheel of a car, but was on a scooter when police picked him for DUI. According to KGVO radio, the Missoula police department sent an officer to a post office when callers reported they had seen a man drinking a can of beer while he was driving a scooter. Witnesses said he spilled part of the beer when he parked and finished the rest up before he went inside the post office. When the Missoula officer and a Montana State police trooper investigated, they found that Langstaff had three previous DUI convictions. That made it a felony charge. Langstaff went to jail but got out a few hours after posting $10,000 bond. Relatedly, one woman in Carlsbad, California, is paying a steep price for her DUI on a motor scooter. 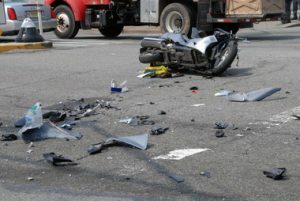 Around 3:45 in the morning of June 29th, the unidentified 19-year-old lost control of her scooter while speeding around a turn and crashed into a center divider on Cannon Road. The impact threw her from the scooter, and she hit the roadside, which severed her arm. Fortunately, a police officer arrived within a few minutes and applied a tourniquet to stop the bleeding. They saved the young woman’s life—but not her arm.